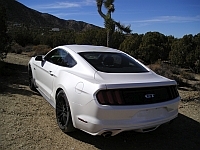 This is the forum to discuss Ford's high performance SVT vehicle line and other Ford Vehicles. It seems that the software wants the video put up as the first or perhaps only entry in the post. When I hit the video button and only showed the youtube link with no other text it worked. I went back and checked and I inserted the link in the wrong spot the time it didn't work. I edited it so the [video] showed on each end of the link and then it worked. I initially had [video, and then the link, followed by ][video], which, of course, did not work. So, one has to be careful. But, it is good. Yes, and, when you click the video button the cursor seems to be in the correct position so that if you paste it will come out correctly. But, in spite of that, I managed to paste the url incorrectly. Who knows how? Perhaps it was those Margaritas? Cool! now I need to get a new GoPro since I lost mine in the desert. I have been missing out on a lot of good crash footage!